Be the Captain of your holiday in one of our luxurious, fully equipped, self-drive houseboats and gently cruise along the Vaal River. A romantic holiday for 2 or a getaway for the family, enjoy the beautiful sunsets and scenery only an hour from Johannesburg. 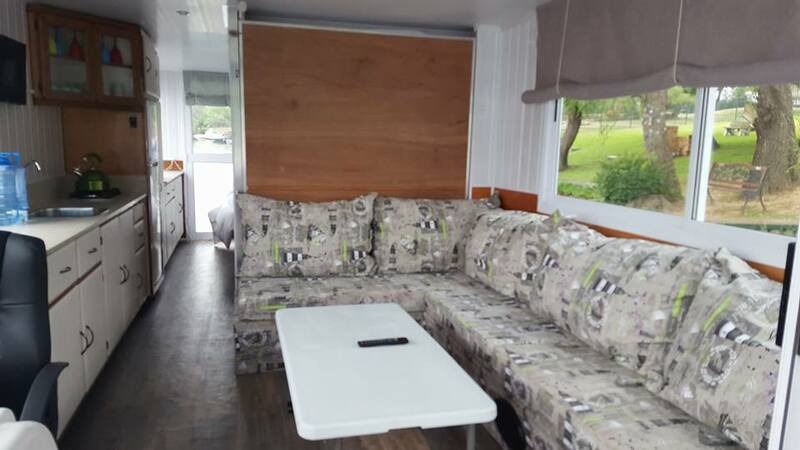 a family of 5 with 2 queen size beds on board. plenty of cupboards to pack your things. a wide variety of both adult and kids movies. adults and kids for your entertainment. The guests are given an extensive tutorial on how to operate the boat and are supplied with an interim skippers license (for the duration of their stay), after which they are in charge of their destination and will only return should they require something extra or at the end of their stay. We expect our guests to have fun and enjoy themselves but to have respect for the things we provide so that other people may also have the privilege of using them. There is no smoking permitted inside the houseboat only outside on the patio or top deck. The kitchen is fully equipped with cutlery and crockery for 6 people. It is fitted with a 2-plate gas hob and a 150Lt fridge/freezer combo. There is a gas braai on the front patio and even a potjie pot on board and with all the utensils you can russell up a meal fit for a king. 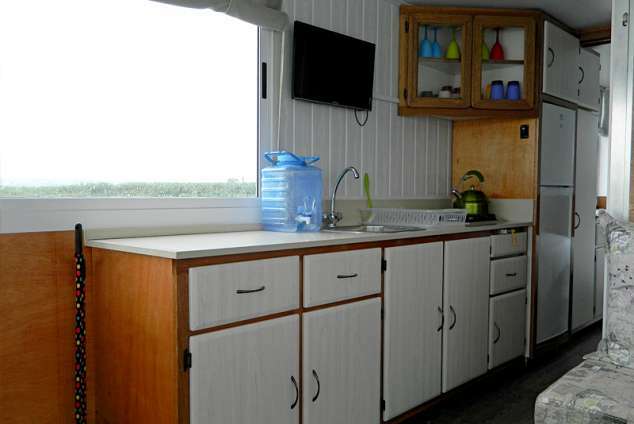 The upper-deck of the houseboat has a large table with seats as well as 2 sun loungers. 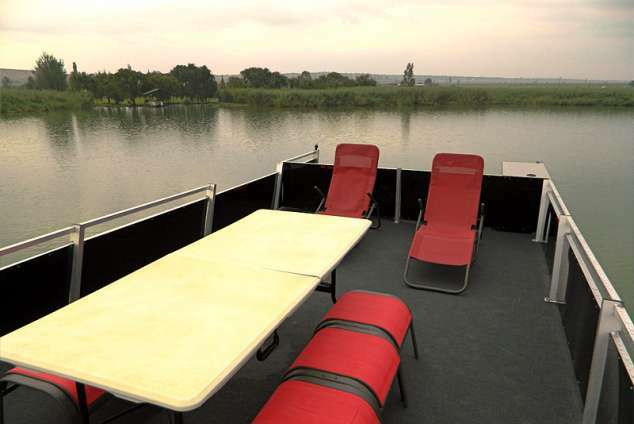 This is the perfect spot "catch a tan" or to enjoy the beautiful sunsets that the Vaal River boasts. The boat comes with pool noodles to float and relax in the water on a hot day and if you are keen to eat out, there are plenty of restaurants and river side pubs to visit. 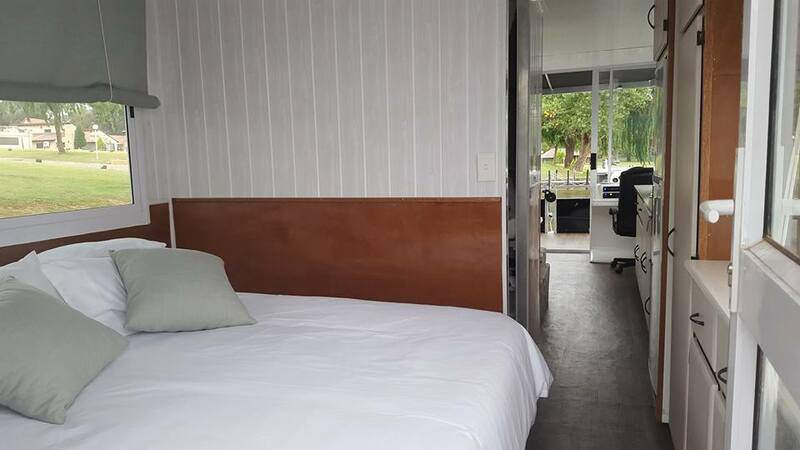 The bathroom is fitted with a standard household toilet, a spacious shower and enough bath towels for the guests on board. your own swimming towels as these are not supplied. fuel. On return of the boat, the fuel usage is calculated and charged accordingly. Prices below are per 2 people. Extra R100 per person to a max of 5 people! We regret that we cannot make exemptions for personal emergencies, rainy weather or any other reason whatsoever as a cause for cancellation. The following applies, unless item "Bad Weather" of these terms and conditions are applicable, in which case the booking will either be rescheduled or refunded"
Notify us of your cancellation within 14 days of your date of charter. Your rental fee less 30% will be refunded. Cancellations received less than 14 days in advance are subject to forfeiture of deposit. Notify us of your cancellation within one month before date of charter. Your rental fee less 30% will be refunded. Cancellations received less than one month in advance are subject to forfeiture of deposit. Once a refund has been paid, the booking is considered to be cancelled, and the Lessee has no claim to reinstate the booking or to any further refunds. The booking dates will only be changed if another Lessee is found to take over the dates of the existing booking. If such a Lessee is not found, the normal cancellation terms apply. An admin charge of R100 will be levied to change booking dates. Any changes in rates, be it because the booking is in a different season (Low, High or Peak season), or rate increases due to yearly price adjustments, will be applicable to the new booking dates. Any balance outstanding as a result of these changes, is payable prior to departure. Non-arrivals are liable for the full hire fee. If the Lessee does not arrive at our premises in good time and fails to let us know that he/she will be late, we may place the boat for re-let.